I’m Jen, and I’m 32 years old. I’m a stay at home mom with three little kids, (whom I adore), but also take me forever to buckle and unbuckle in their car seats, when I’m trying to avoid the late burpee penalty. I’ve had a lot of those moments, but the most recent one was this year’s Open during the dead lift, wall balls, and rowing. I remember yelling for a bucket because I was afraid I would lose my breakfast in front of everyone, but I was even more afraid I would pass out and my score wouldn’t count! I love rowing, squats, and pretty much anything involving a barbell in my hands. There is something about that barbell that’s magical and makes you feel like a badass. Like Cinderella putting on her glass slippers, it just transforms me. Box jumps! Anyone who has worked out with me, knows how much I fear them. I don’t think there is enough time to list all of them, because there are so many, but I’m still chasing my first pull up, and I also want to try and hit a 300# squat this year. Overall, I want to get more confident and efficient at all the movements. Seeing personal progress, not only with fitness, but with my mental health as well. I’m in such a bad mood if I can’t come to The Rock for a couple days. Dana told me before I started, “Lookout, it’s addictive” and I remember thinking that was the most ridiculous thing I had ever heard. Who gets addicted to working out when it’s such a chore? Now I get it! The adrenaline rush after completing a hard workout, that cloud 9 feeling you get after hitting a PR after you have been working for weeks and weeks, or the high five from a friend who collapses on the floor next to you – it’s the best feeling ever!! Cheeseburgers, Coca Cola, and ice cream!! Everyone says it, but it’s FAMILY to me! When I walk in those doors, I feel at HOME and that’s something I NEVER, ever, thought I would say about a gym. I love the smell of iron, and the sound of the weights hitting the floor. It’s my safe place, and my support system. I’m a stay at home mom, and after my first baby, I found myself disconnected and lonely. I used to see friends maybe once a month or every couple months. At the Rock, I get to see friends almost every day, and because of that, they know what my day-to-day battles and struggles are that I am dealing with, and we support and encourage each other inside, and outside, the gym. I think that’s really special and I don’t take it for granted. Shout out to my #MomSquad ladies! For the first time in my life, I appreciate my body for what it can DO, not for what it looks like. I hated my legs growing up, because they were so much bigger than the other girls, but now I appreciate that I can squat, and now I love my legs. It also makes me appreciate the different sizes of the others ladies. Instead of resenting them for being smaller or different than me, I’m cheering them on, because I’m so proud and impressed with their gymnastics or other skills that they are working hard at too. Rocktown Crossfit has just transformed the way I think about body image and what “healthy” looks like. I was never a good athlete, and always struggled with my weight. I had extremely high blood pressure with my first pregnancy, and was diagnosed with gestational diabetes with my second baby. After those health risks, I decided I needed to change my life style. I was petrified to go to the gym, but I was determined to change. One day, I overheard Dana talking about coaching and asked her about it. 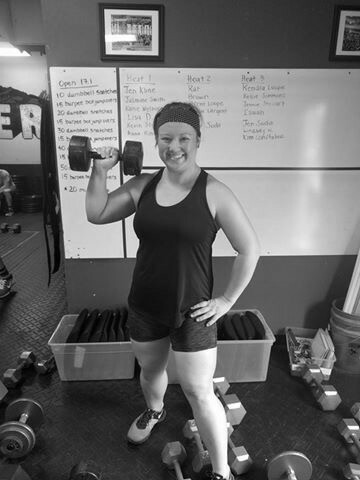 I had never even heard the word “Crossfit” before and as she started talking to me, Lauren Black walked through the door, right at that very moment, and to this day I feel like it was fate. Both of them invited me to come to a class, and I said I would try it. After walking through the doors, I almost walked right back out, because the things people were doing looked impossible to me. I’m so glad I didn’t, because it has changed my life. I had three kids in three years, but only worked out with the third baby, and it made such a huge difference! It’s taken me some time to get back in the swing of things, but I’m the strongest I’ve ever been in my life. All the coaches are wonderful and I’ve learned something from each of them. Lauren has been my primary coach at 9am and I’m always so impressed with how she personalizes the workouts and remembers so many personal record numbers. It really shows how much she cares about your progress and wants you to succeed. Shout out to my husband who always supports my fitness goals and encourages me to go to The Rock (especially since he knows I’ll be in a bad mood if I can’t go, haha). I love my Rocktown Family! Its been almost 3 years since the first time Jen walked through our doors and she has not looked back! She was one of our pioneer pregnant mamas and set the standards as high as you can for so many to follow. She showed that its ok to be pregnant and workout, and how much easier it made the bounce back once she was able to return. But it did not stop there…her example at home is what will really turn your head. She is constantly sharing photos of her kids being active, doing burpees or practicing handstand holds in their basement, one of their favorite moves from crossfit preschool! Being the mom that she is its important to her to maximize her time in the gym. If Jen gets there early, she will do 50 wall balls and some assault…class ends early? You’ll find her doing a mile run. Some of our favorite moments though come when Jen leaves “the comfort zone” which is commonly accompanied with a bucket or a trip out to the grass As her journey continues the strength and confidence continue to shine through. Congrats Jen and we can’t wait to see that 300lb squat very soon!